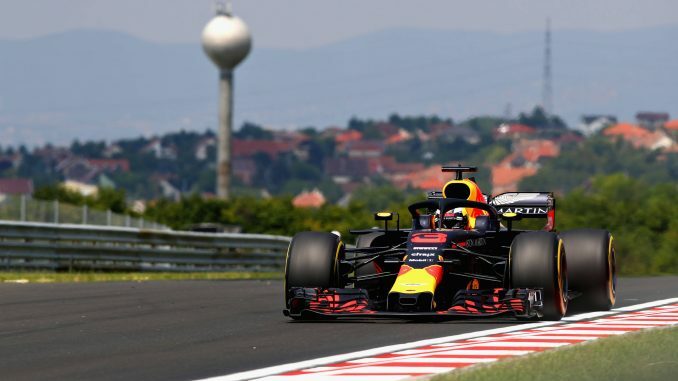 Sebastian Vettel finished the day fastest after Daniel Ricciardo posted the quickest time in FP1 at the Hungarian Grand Prix. 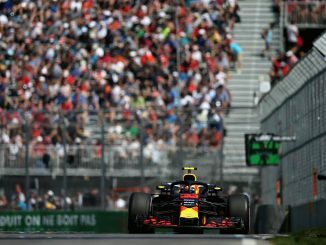 The Red Bull driver set the quickest lap in the morning, just ahead of the Ferrari and his teammate Max Verstappen, before Vettel and the Dutchman went faster in FP2, while Kimi Raikkonen was fourth in both sessions. 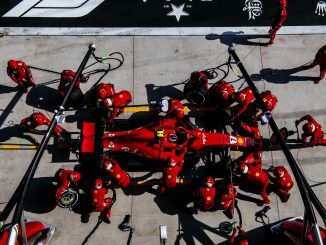 Red Bull’s pace was strong over one lap on the soft tyres, but the Ferrari showed strong race pace on their long runs in the afternoon. 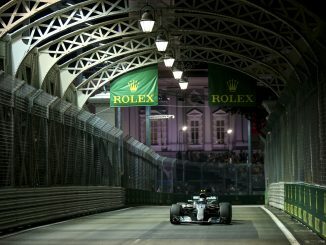 Mercedes had to settle for third best, with Lewis Hamilton and Valtteri Bottas fifth and sixth respectively in the two practices, both over 0.5s off the quickest cars. Haas’s Romain Grosjean was the quickest driver from the midfield teams, finishing less than 0.2s behind Bottas in the afternoon. Teammate Kevin Magnussen didn’t look as comfortable as he was unable to trouble to top 10 in FP2, posting a time over 0.8s slower than Grosjean. Carlos Sainz showed strong pace for Renault, but his teammate had a difficult day, missing most of FP1 with an electrical issue which limited Nico Hulkenberg to 14 laps in the morning. Renault rebuilt the car over lunch to get the German back on track in the later session, and he mainly run on the medium tyres, leaving him in 14th. Pierre Gasly will be hoping to challenge for a spot in Q3 tomorrow after two consistent sessions for Toro Rosso today. The Frenchman was just outside the top 10 in FP1 before improving this afternoon to end the day less than half a second down on Grosjean’s time and over 0.4s quicker than teammate Brendon Hartley, who suffered a spin towards the end of first practice. Sauber had to put a new floor on Marcus Ericsson’s car after he lost control in FP1, leaving him at the bottom of the standings in the morning, while Charles Leclerc made way for reserve driver Antonio Giovinazzi. Despite missing the opening session, Leclerc ended FP2 just over 0.1s behind his teammate, although both cars were in the bottom five. Force India headed to this race knowing their future is uncertain following talks of a takeover bid, but the team put in a solid performance on track. After a slow start to the day, Esteban Ocon and Sergio Perez finished 10th and 1th respectively, with Perez less than 0.1s adrift, giving the team hope both cars can progress to the final part of qualifying tomorrow. Fernando Alonso continues to find more pace in the McLaren than his teammate, Stoffel Vandoorne. The two-time champion was just 0.007s behind Perez in FP2, but Vandoorne ended the day as the second slowest car. Only Sergey Sirotkin was slower than Vandoorne in FP2, although the Russian spent most of the session running the medium tyres. His teammate, Lance Stroll, preferred the softs and ultrasofts, but was only 0.1s quicker than Sirotkin, leaving both Williams cars in the bottom three.